I have tried to download opera mini 4.4 it is ok but the problem is that instead of saving it cancels and the final answer is that the downloaded JAR is invalid.what might be the problem? Are you installing by going to http://m.opera.com with the phone’s built in browser? Did you try all three signed versions on m.opera.com and none of them work? Does the unsigned version work? Pls send or attach a a link to a signed version opera mini 7 to my email. Thanks for your good jobs. There’s a link to the signed version of Opera Mini in the post. I don’t see any point in emailing the link when you can download or install it from this web page. My nokia 2630 cannot download opera mini it is showing my certificate not on phone or sim. Please what should I do. You will need to use the unsigned version. Opera recomends Opera Mini 4.4 for the Nokia 2630. I’v bn using 6.5 version on my sonny ericssom W890i i deletd hoping 2 gt an updatd version whch z nt posibl nw as its only 3.2 vers. whch i’m able 2 dwnload,z there nthing i cn do plz?? My phone alwys tells me that there is no certificate on it. In that case you have to use the unsigned versuin. In that case you have to use the unsigned version. I don’t think that’s possible. If it is I don’t know how to do it. Are you familiar with Net10 LG 900G? I am trying to get on the web when roaming. I understand I need something like mini opera to do it but I have downloaded it (version 7 and 4.4) but still doesn’t work. I get message “Check Data Restrictions -36”. This isn’t on point to this blog, but I’m hoping you can help! The message indicates that Net10’s agreement with the roaming carrier does not include data. Using a different browser isn’t going to change that. I would wish down for me opera mini on my 3110c mob.phone , it failed coz of certificate pbms yet I don’t know any and am in of it coz I saw it to ma friend’s nokia2630 wen it was w/c inspired to have it too.THANX am waiting!!. If you already have Opera Mini installed, try removing it before trying to install the signed version. Also, try all three signed versions, if they all give a certificate error your phone doesn’t support the certificates Opera uses and you will need to use the unsigned version. Hi. I cant download opera mini on my nokia 5000d because of certificate problems. What can i do? 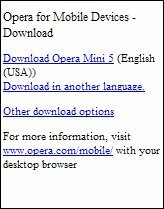 If you have Opera Mini installed, uninstall it and try installing the multiple certificate version. If none of the three signed options work you will have to use the unsigned one. I just bought the LG 900g and a 4g card. Now what i want to know is what is how do i get started on apps? Do i need a certain music app, and do i need opera mini? Sorry, i am just trying to fully understand on learning to get started on apps. Opera Mini is a better browser than the stock one. You don’t need it but you will probably prefer it. To get started with apps go to an app download site like http://boostapps.com, http://wap.getjar.com/ or http://mobilerated.com and browse what’s available. i m using opera mini 6.1 in my samsung gt-b7722,i modified the jar file for my screan resolution 240*400,its working good but the browser is’nt download or saving ne file,than i downloaded the uc web 8.2 but the same problem occurs.Tell me wat to do ? Try using the signed version by modifying the jad file as described in this post. If you modify the jar it’s not signed. Most phones don’t let unsigned 3rd party apps save anything. It that doesn’t work your phone doesn’t support Opera’s signed versions. I’ve my LG (u8138)with complete user certificate not supporting java apps.pls help me! The LG U8138 does support Java. What error do you get? Read the post it tells you how to install signed Opera Mini versions. That doesn’t look like a proper jad file download from Opera. For one thing is not signed and for another the MIDlet-Jar-URL: is malformed as it it doesn’t start with http. Thank you its really helpfull. This post explains exactly how to download signed version of Opera Mini on any phone. It you follwed the instructions and its not working you need to describe the failure including any error messages for anyone to be able to help you. i can’t save page in my Nokia 3110c with opera mini. plz help! First you need to use a signed version. Then highlight Opera Mini, click Options, choose Suite Settings and set Read User Data and Write Use Data to Allowed. Go to http://mini.opera.com with the phone’s browser. I finally can save pages on my lg 900g. I tried some of the signed 6.1 & got success on the Thawte version. Thanks very much. I want to download opera mini but my phone say no certificate. Pls help me. It you get the certificate error with all three signed versions you have to use the un-signed one. There’s no way to add certificates to most phones. Try all three signed versions and if none of them work you will have to use the unsigned versions. can yu plz choose me a rite browser to my nokia 2700c……?? Can you provide me a link of Opera mini 6.0 signed version as it best suits my Nokia 3110c. I’ll be very grateful to you. 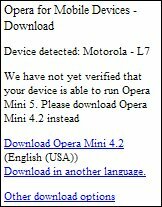 The Opera Mini 3.2 low memory signed version does not exist. If by any chance you find it, please reply to this post. 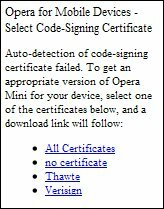 Opera never released any signed versions before Mini 4.0. Low memory really means it supports the Java MIDP 1.0 profile for compatibility with very old (at least 6 years ago) phones. MIDP 1.0 doesn’t support signed apps. It sound like your operator crippled the phone by removing the certificates. It’s not possible to install certificates on recent S40 phones like the 2700c. You will have to use the unsigned versions. I get too many questions to reply to comments by email. If you want replies by email check the box on the comment form. And unless you love SPAM don’t put your email in the comment body where spammers can harvest it. When I copy the link for the .jar file out of the .jad file it just sends me back to the unsigned version! The signature is in the .jad file. To install the signed version copy both the .jad and .jar to the phone’s memory card and open the .jad using the phone’s file manager. sir how to remove opera mini from micromax x550 qube for install other version of opera? in my nokia 2700 the default browser is opera . I want to download the latest version 6 for copying text etc but the problem is when i download from my phone browser the opera 6 icon loads but doesnt connects with the net.it only connects when opened with the default browser. i have tried all the signed and unsigned version. what to do? i want install opera mini 6 by my ‘ p1i ‘ browser with “all certification” but in end of installation “security information” say: component failed security check cannot install. There is no option ,,all certificates” for Opera 3.2 just for 4 and other. That is correct. 4.0 was the first Opera mini release to have signed versions. You can also download unsigned version or signed & your problem will be solved. Go to end page of http://m.opera.com, you will get it! There is no Opera Mini 7, 6 is the latest.